Live webcam View on the skiing area Ciampinoi and Sassolungo. 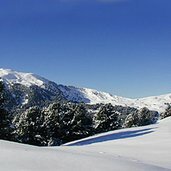 Live webcam View towards the hiking and skiing area. The Val Gardena Valley offers an extraordinary mountain landscape, which is among the most beautiful in the world. 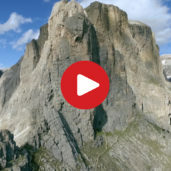 Situated in the north west of the Dolomites, this area is characterised by a fascinating natural landscape and combines it with a large number of holiday suggestions. We have captured its beauty from above. 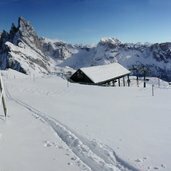 See panorama View over the skiing area Seceda - Colraiser in Val Gardena. See panorama Skiing area Seceda - Colraiser with panoramic view over the Dolomites: Odle, Stevia, Sella, Sassolungo and Alpe di Siusi. 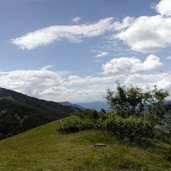 See panorama Fascinating view on S. Cristina and surroundings. See panorama This picture was taken about 100 m from the Road to Passo Gardena. 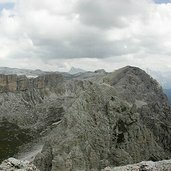 See panorama Great view on Passo Gardena and the Dolomites. If you want to keep fit and are one of those oh-so sporty kind of holidaymakers, this is the place for you. Countless hiking trails, lifts and traditional huts are waiting to be discovered. 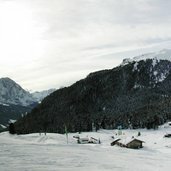 And in winter, the ski circuit of Sella Ronda has a lot to offer to skiers and snowboarders alike! But Val Gardena is famous not only for its numerous winter sports opportunities; also the wood-carving tradition of Val Gardena is known on an international scale. More information about the Gardena Valley is found on www.valgardena-groeden.com. Our tip: embark on a trip to the Puez-Odle Nature Park; weekly guided tours are on offer! Ladin Cultural Institute "Micurà de Rü"
Travelling to South Tyrol across Passo Brennero. Welcome to South Tyrol’s capital!